Celebrate your birthday by drinking legally and keeping your drink cold while doing it. 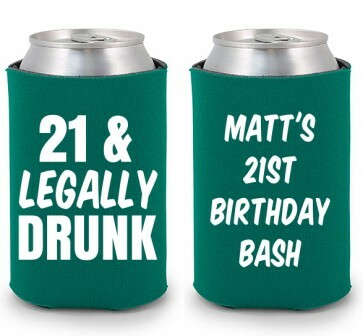 You might not remember your 21st birthday but will have a great koozie to remember it by. Who even remembers their 21st birthday? Change that by using the 21 & Legally Drunk template for your birthday koozies that will last longer than your faded drunk birthday memories. Add this template to any of our koozies and customize it in any way imaginable with many koozie and ink colors to choose from.